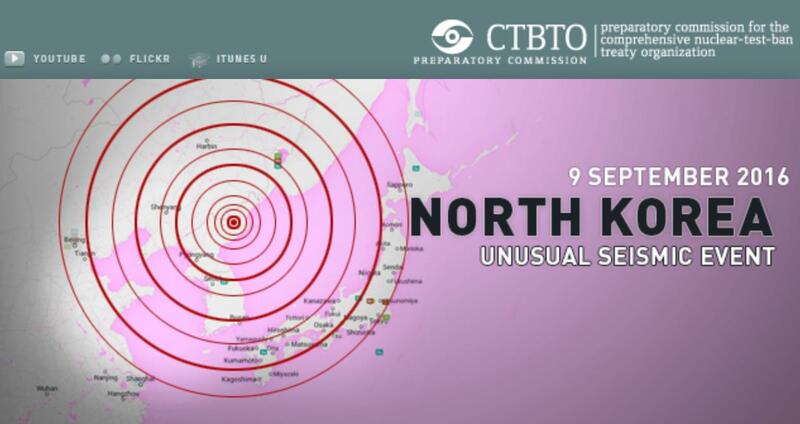 One can hardly phrase it more carefully than that: "Unusual Seismic Event in North Korea". This description of what is without a doubt the fifth test of a nuclear weapon by the reclusive, authoritarian regime of Kim Jong-un in North Korea was seen on the website of the CTBTO, a United Nations organization based in Vienna, Austria. On Friday night, half an hour after midnight (UTC), seismic stations all over the world picked-up seismic waves eminating from the test site Punggye Ri in the province of North Hamgyong, located about 235 miles northeast of North Korea's capital Pyongyang. Four times since 2006, seismic waves like these were detected from the same site. Each time it turned out that these waves did not originate from a regular tectonic earthquake, but from a nuclear test conducted by North Korea. The last such test took place on January 6th of this year. The explosion at that time raised the question as to whether the North Koreans had tested a hydrogen bomb, which has much more destructive power than an atom bomb, like those dropped on Hiroshima and Nagasaki in the final days of World War II. The reason for this speculation - which has yet to be confirmed - was the equivalent earthquake magnitude of the detonation in January. It registered between 5.1 and 5.2. With a magnitude of 5.3, today's event was even stronger. However, the various types of nuclear weapons cannot be distinguished by seismic detection methods. That's why shortly after the latest detonation China and Japan sent "sniffer" airplanes towards the North Korean territory. They collected air samples looking for radioactive isotopes, which might have escaped during the underground nuclear test. Analyzing the composition and distribution of those isotopes would allow to uniquely identify the type of weapon tested. As of this writing, no results have been published from the analysis of air samples. If politicians and scientists all over the world are so certain that Friday's seismic signals did not eminate from an earthquake but from the detonation of a nuclear device, why was the CTBTO so reluctant to initially call it what it really is? The reason has to do with diplomacy. The abbreviation CTBTO stands for "Comprehensive Test-Ban Treaty Organization". It took decades of careful negotiations before this organization was put in place by the UN in 1996. It has only one mandate: to monitor if a clandestine nuclear weapons test is conducted by anyone, anywhere on Earth. Now, more than 180 countries have signed that they will abide by the test-ban and have become members of CTBTO. There are, however, a few hold-outs like India, Pakistan, Cuba and North Korea. All other nations in the nuclear club (the US, Russia, China, France and the UK) have at least signed the charter, although China and the US have yet to ratify it. And what does CTBTO do? They operate a world wide network of several hundred seismic, infrasound and hydroacoustic sensors, which can detect any nuclear test that takes place underground, in the atmosphere or at sea. In addition, at 80 stations distributed around the globe air samples are collected, similar to what the sniffer airplanes were doing shortly after today's North Korean test. The air samples of the CTBTO stations help identify the type and origin of nuclear devices. Figure 2 Berkeley's seismic station near Yreka in Northern California recorded North Korea's latest nuclear test very clearly. The three traces represent the three degrees of ground motion (from the top): vertical, in the North-South direction and East-West. However, CTBTO cannot operate its vast network of stations alone. It gets help from various institutions in the signatory states, among others from the Berkeley Seismological Laboratory. Our station in an abandoned mine near Yreka in Northern California, dubbed YBH, operates with a dual purpose. While YBH is an integral and important part of the Berkeley Digital Seismic Network, it also sends live seismic data to CTBTO's operations center in Vienna, Austria.